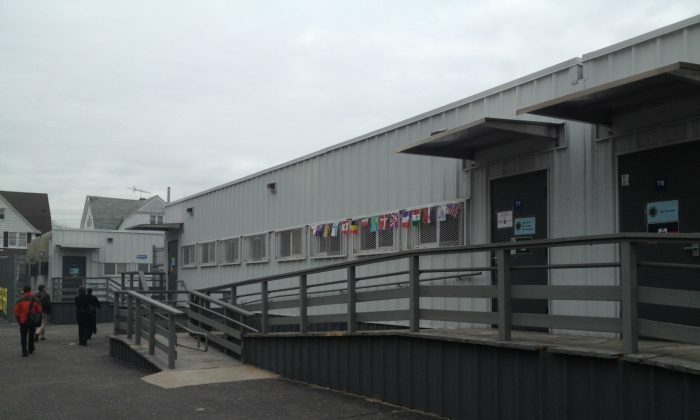 NEW YORK—The Education Department has allocated money in its capital budget to remove an eyesore structure and reminder of classroom overcrowding over the past 10 years. Classroom trailers, or Transportable Classroom Units (TCUs), were installed a decade ago as a temporary measure to alleviate school overcrowding. The classroom-size metal structures are parked on school property and equipped with bathrooms and air conditioning. In 2008 city schools required more than 400 trailers. Queens, with the most overcrowding, used half. This year schools are using 320 trailers. School administrators have complained about their deterioration as the trailers age. Former Mayor Michael Bloomberg promised to remove them in 2006, but dropped the idea a year later as overcrowding worsened. The Department of Education’s (DOE) five-year capital budget has allocated $480 million to remove the trailers. Removal plans, however, have not specified alternate classroom space for the 8,000 students who now take classes in them. Even though the city has created 104,000 new school seats since 2004, about 60 percent of public schools are still overcapacity, according to DOE 2011 data. The city now proposes $3.3 billion to create over 32,500 schools seats in the next five years. There are about 17,000 students already waiting for those seats, according to DOE. Estimates for 2021 indicate at least 20,000 more students needing space in New York City, according to Statistical Forecasting LLC, an educational consulting firm the projects school enrollments. The Council of School Supervisors and Administrators remains “cautiously optimistic” about the capital plan. “We need to be sure that 32,500 plus new seats will be enough to take 8,000 students out of the trailers and put them into a real classroom,” he said in council testimony during a March 18 budget meeting. The council pointed out the previous capital plan made a similar promise, but didn’t deliver. The city’s Panel for Educational Policy was expected to approve the capital plan Tuesday night.